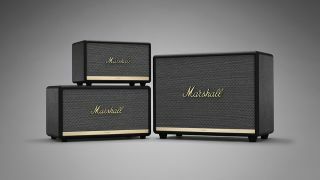 Marshall launches new Bluetooth speakers and £120 wireless in-ears | What Hi-Fi? Marshall may have recently become the umpteenth audio brand to enter the ‘smart’ (voice-controlled) speaker market, but that hasn’t led the eminent guitar brand to forget its more modest speaker offerings. Today, it has announced a refresh to its Bluetooth speaker line, the three new models in which are available now. The new Acton II Bluetooth (£219), Stanmore II Bluetooth (£299) and Woburn II Bluetooth (£439) speakers keep their predecessors’ trademark guitar amp aesthetic (phew), but this time use the 5.0 version of the Bluetooth codec and benefit from upgraded DSP (digital signal processing). Marshall says the latter has improved dynamic range compression for better performance regardless of what volume music is being played at. The Acton II Bluetooth is the smallest speaker with twin tweeters and a mid/bass driver each driven by a dedicated Class D amp. The middle-child Stanmore II Bluetooth is more powerful with a maximum power output of 80 watts, while the Woburn II Bluetooth ups that to 110 watts, featuring two tweeters and 5.25in mid/bass units apiece. Two speakers in the range can be paired to play music simultaneously or as a stereo pair. That’s only over Bluetooth though – not via wi-fi like Sonos, Bluesound and Marshall’s dedicated multi-room versions of Acton, Stanmore and Woburn – so both speakers have to be within 30ft (10m) range of the source device. The Marshall Bluetooth app can be used to facilitate this, switch between EQ presets and set the intensity of the speakers’ LED lights. Marshall has also updated one of the first pair of headphones it launched back in 2011. The all-new Minor II (£120) feature aptX Bluetooth, 12 hours of wireless playback from a single charge, and magnetic earbuds that help them stay firmly around your neck and helps preserve battery when not in use. Quick charge functionality means 20 minutes of charging will provide two hours of playtime (two hours will charge the battery full), and there's also a microphone and multi-directional control knob to control playback and phone calls.